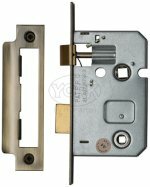 Bathroom door lock for use with bathroom set door handles and thumb turns. Deadbolt incorporated in the lock is operated by thumb turn. Available in brassed, nickel, black or floretine bronze/antique brass plate edge finish, with flat striking plate. Available in 2 ½ inch size (with 45mm backset from edge of door to handle turn) or 3 inch size (with 57mm backset from edge of door to handle turn). York bathroom door lock to match the finishes of the Heritage Brass range. Suitable for use with bolt through fixings. Bathroom dead bolt, suitable for bolt through bathroom thumb turns to take a 5mm spindle. Available in 2.5 inch - 64mm (with a 45mm backset), 3 inch - 76mm (with a 57mm backset), 4 inch - 102mm (with a 82mm backset), 5 inch - 127mm (with a 108mm backset) and 6 inch - 152mm (with a 127mm backset) sizes, with polished brass, bronze/antique brass, black, polished chrome or satin chrome forend and strike plate. 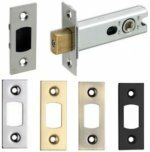 Architectural quality bathroom lock with patented spring and latch reversal system, for use with bathroom set door handles and thumb turns. Deadbolt incorporated in the lock is operated by thumb turn. Available in PVD brass, floretine bronze, polished steel or satin chrome edge finish, with flat striking plate. Suitable for bolt through door furniture. 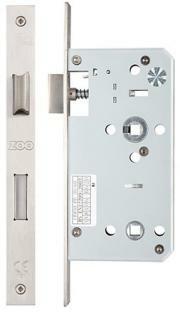 Zoo horizontal bathroom door lock for period properties. Available in 5 inch (124mm x 70mm) & 6 inch (149mm x 70mm) case sizes. 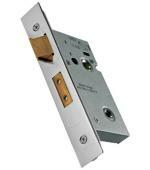 5 inch lock has 4 inch (101mm) backset to centre spindle, 6 inch lock has 5 inch (127mm) backset. Available with brass or chrome forend and strike plate. Delamain thumb turn for use with bathroom door locks or dead bolts, with emergency release on outside. Size 45mm diameter. Solid brass oval shaped thumb turn on a 45mm diameter round rose, for use with bathroom door locks or dead bolts, with emergency release on outside. Heritage brass V4040 thumb turn on a 50mm diameter round rose, for use with bathroom door locks or dead bolts, with emergency release on outside. Available in Polished Brass, Antique Brass, Satin Brass, Polished Chrome, Satin Chrome, Satin Nickel & Matt Bronze. Thumb turn for use with a bathroom door lock or dead bolt when fitted with door knob or lever, with emergency release on outside. Size 45mm diameter. Thumb turn, to match the Vision designer levers, for use with bathroom locks and deadbolts when fitted with door levers, with emergency release on outside. Size 51mm diameter. Thumb turn, to match the Italian designer levers, for use with bathroom locks and deadbolts when fitted with door levers, with emergency release on outside. Size 51mm dia. Large solid brass designer thumb turn, for use with bathroom locks and deadbolts when fitted with door levers, with emergency release on outside. Size 50mm diameter , 8mm depth. Thumb turn with engaged indicator, to match the designer levers, for use with bathroom locks when fitted with door levers, with emergency release on outside. Size 51mm dia. Stainless Steel thumb turn, to match the stainless steel levers, for use with bathroom locks and deadbolts when fitted with door levers, with emergency release on outside. Available with or without indicator. Size 50mm dia. Available in 316 grade and 304 grade Polished Stainless Steel & Satin Stainless Steel. 316 Grade Size 50mm diameter, 6mm depth. 304 Grade Size 50mm diameter, 8mm depth. Stainless steel bathroom thumb turn to match the SWL stainless steel door lever handles. Size 52mm diameter, 7mm depth. Square thumb turn, to match the designer levers on square rose, for use with bathroom locks and deadbolts when fitted with door levers, with emergency release on outside. Size 51.5mm x 51.5mm. Thumb turn, to match the Rosso Magniglie designer levers, for use with bathroom locks and deadbolts when fitted with door levers, with emergency release on outside. Size 50mm round rose or 50mm square rose. Available in Polished Chrome, Satin Chrome, Black & E-Bronze. Cebi bathroom thumb turn, for use with bathroom locks and deadbolts when fitted with door levers, with emergency release on outside. Size 53mm x 53mm. Available in Polished Copper, Satin Chrome or Black finish. Ludlow Foundries black iron oval thumb turn for use with bathroom door locks or dead bolts, with emergency release on outside. Size 38mm oval diameter. Contract stainless steel bathroom thumb turn to match the contract steel door levers, supplied with non indicator rose (as shown) and additional engaged indicator rose. 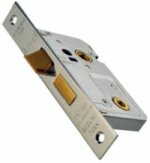 Architectural Din bathroom lock, lock case size 90mm depth, 165mm height, 78mm centres, stainless steel face plate 22 x 235mm. Available with a 60mm backset or a 55mm backset to the lock centre. Fire tested to 120 mins on timber doors and 240 mins on steel doors. DDA compliant BS8300 thumb turn on a 50mm diameter screw on rose. 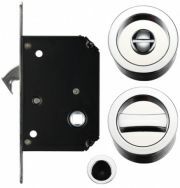 Sliding bathroom door lock set with WC turn, flush pull and lock. Thumb turn 57mm diameter, flush pull 29mm diameter, lock case 100mm x 70mm with a 50mm backset to turn. Stainless steel toilet door indicator, with engaged/vacant indicator and emergency release.